From 41 to 534 Phone Calls a Month! In just 6 months Florida Woman Care went from having an OB/GYN website that was virtually unknown and only a trickle of new patients to having numerous search terms showing up in the #1 position and dozens in the top 10. They have since become an authority in Jacksonville gynecology. By the end of the year were ranking for numerous keywords in the top 10 related to Jacksonville gynecologist and gynecologist near me. Their phone calls went up from just 41 phone calls for both locations to over well 200 for each (242 and 292 to be exact). Florida Woman Care’s two locations are now competing with some of the biggest names in Jacksonville gynecology, including North Florida OB/GYN who has 30+ locations in Jacksonville. Their traffic of under 100 web sessions per month climbed quickly to over 12 times as much at 1200 per month! Florida Woman Care needed a new website and a marketing campaign to get new patients. Their old website wasn’t ranking for any search terms until at least the third page of Google, rendering it functionally non-existent. 60+ percent of searchers click on the top 3 search results and 91% of searchers select a result on the first page. Florida Woman Care wanted to develop a website that would be the foundation for their online visibility campaign in an effort to attract new patients and raise awareness of their clinics and establish their brand. Florida Woman Care had been on the internet for well over a decade, but unfortunately so had the same site. It wasn’t mobile responsive, and it wasn’t optimized for search engines. Google didn’t like it so it didn’t show up. We worked with Dr. McDyer to create a fresh new site using the WordPress CMS to lay the foundation for a well-optimized, sleek, and secure site that would be the basis of our online marketing efforts for the future. While Dr. McDyer was very active among doctors in the area due to his involvement with OB/GYN issues and involvement as Chairman of Section 2, District 12 of The American College of Obstetricians and Gynecologists he was not well known outside of the medical community with potential patients. His site would help change all that, and his videos were a big part of that effort. Videos are a high-value content, and when used properly can really help a site show up in search rankings. They also help potential patients to feel like they get to know the doctor and feel more comfortable. With a doctor like an OB/GYN comfort and trust are crucial. Dr. McDyer was already coming out with some great unique and helpful content for his patients with his video series. We also turned those into blog posts, which makes it easier for Google to figure out what he is talking about and makes sure if anyone doesn’t want to watch the video they can still get this valuable information. Google likes that. The greatest site is worthless if nobody knows it is there. That’s where backlinking comes in. When other sites link to your site it is presumably because you have something useful that can help their readers, which is a good thing. The more trustworthy and important the site that is linking to you, the better. We put together a backlinking strategy to help Dr. McDyer get noticed and get the backlinks to jumpstart his site so it could start showing up in search rankings. Dr. McDyer and Florida Woman Care were focused on building a sustainable long term practice where the work put in now is utilized to build a strong foundation that can continually reap rewards in the future. Sometimes it may be appropriate to supplement such longer term strategies with short-term strategies like advertising that will help to get more immediate new clients, but in Florida Woman Care’s situation they wanted to focus their money on building a strong foundation quickly, and it paid off. Florida Woman Care was able to make huge jumps in both search rankings and phone calls in just 6 months, increasing the number of new patients at both locations substantially. When January came around Florida Woman Care had 10 times as many phone calls as in August and 10 times as much web traffic! Dr. McDyer’s video series did more than just help to catapult him in the search rankings. They also helped to increase the quality of care he was able to deliver to his patients and help his patients get to know him as a doctor. Dr. McDyer designed the content for his videos around common questions and concerns that he had come across in his gynecological practice. After he finished the videos he was able to use them both on the web and in his waiting rooms. He got overwhelmingly positive feedback from his patients about the videos in his waiting room. They helped to answer general questions that many women have and start their appointments asking. This allowed Dr. McDyer to more effectively utilize his time finding out more about what was special about the patient’s unique concerns beyond those general questions. This graph shows that we were originally tracking over 125 keywords and nothing was ranking. By January we had helped Florida Woman Care to achieve a significant amount more phone calls and web traffic by breaking into the top 10 for a number of keywords. 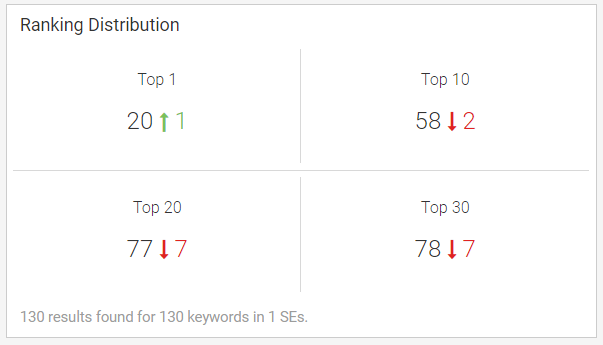 By April their rankings had grown significantly more, and they continue to grow today. Florida Woman Care is now competing with some of the biggest acts in town such as North Florida OB/GYN (which has 30+ locations) per month to use on online marketing and visibility. That money was strategically applied to get the most return and to make the most difference to the bottom line of Florida Woman Care. Is This Repeatable for Your OB/GYN Practice? Can we get similar results for another OB/GYN elsewhere targeting important keywords to your practice? Absolutely. How long it takes to achieve the results will be dependent on the competition your practice is up against, but the results are a matter of continual targeted efforts and time. The competitiveness of markets tends to vary significantly across the US, and it is unsurprisingly going to take a larger amount of money to rank for competitive keywords in more competitive markets. We don’t take clients if we don’t think they can be competitive in their target market with their budget. We’re here to help our clients grow their businesses. What About an OB/GYN Practice that Needs Patients Now? Ads are a great solution for getting immediate results. For business owners who want some immediate return on investment we recommend doing a combination of ads and content marketing. The content marketing will build your website into an online digital asset that when done right compounds in value as more content is added and can continually generate new customers over the long term. Advertising lacks this compounding effect. This was rumored to be an Einstein quote, but it may not have been. Regardless of who said it, compound interest is still the reason why Warren Buffet is one of the richest men in the world. Even if its effects aren’t the most powerful, it is a force to be reckoned with. Ads such as AdWords and Facebook Ads are great supplemental measures while building a campaign to get traffic and sales that can be continued as long as they are successful, but content marketing is an investment that will pay much greater returns in the long run. When the returns from content marketing start compounding that’s where the investment really pays off. Want More Phone Calls for Your OB/GYN Practice?